the Makerie: we're still here! In keeping with the spirit of openness and authenticity, I wanted to share where I am too. First, we're still here, planning away for 2013! That you can be sure of, and boy do we have some exciting new developments! As much as I love summertime and the freedom it brings, I also find it trickier than ever to balance things this time of year. 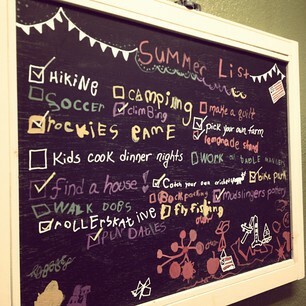 I cherish my time with my little ones and want them to have the best memories of their summers. I strive to schedule just enough camps to give them awesome experiences, but also want to preserve lots of unscheduled time for us to be free and spontaneous. What other time in their little lives can they have this gift of total freedom? Babysitters are infrequent, which also leaves me very little time of my own during these months. My 'to do' list grows bigger and I often feel overwhelmed. (Confession here ~ I sometimes write really easy things on my list just so I can check them off!) If you're reading this, thank you so much for still being here since it's been over a month since I last posted. (Yikes! How did that happen?) I want to be here more... I really do. I think about the Makerie all the time and the amazing people who have made this journey one I'll never forget. Please be gentle with me, as I'm working on being gentle with myself too! Even though our online presence during this time isn't as full as usual, I want to assure you we are busy as ever behind the scenes over here. Some pretty special projects are in the works that we're really excited to share. Please make sure to friend us on facebook, follow us on twitter and join our email list for the latest announcements! For the next few weeks, our family will be checking the last things off our summer list, which includes a move to a new house and we can't wait. I cherish this creative community with all my heart and appreciate all of your support more than you will ever know. So hang tight, we'll be back with some amazing announcements soon!